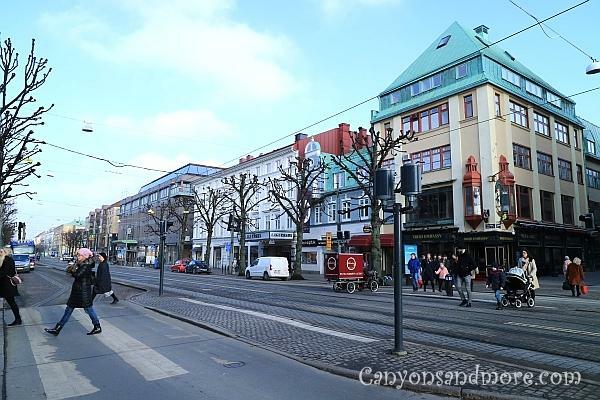 The starting point of this journey was in Kiel, Germany. 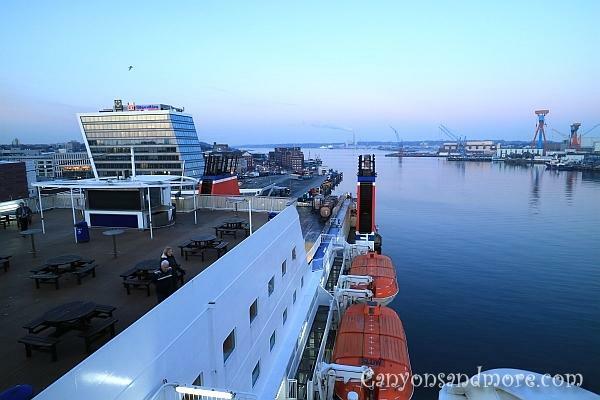 There is a ship “Stena Line” that goes daily from the Port of Kiel to Gothenburg. The ship leaves in the evening and travels overnight. 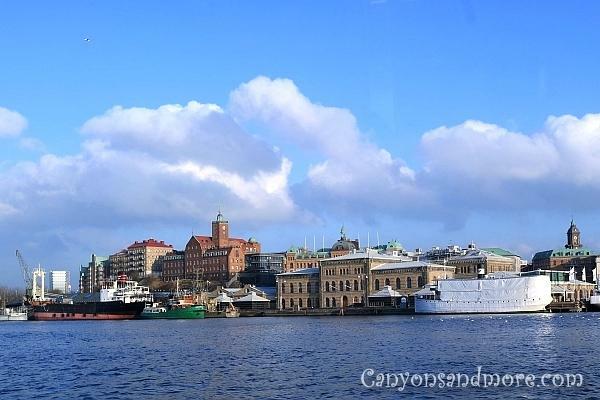 At 9 a.m. you arrive refreshed for a day at Gothenburg. 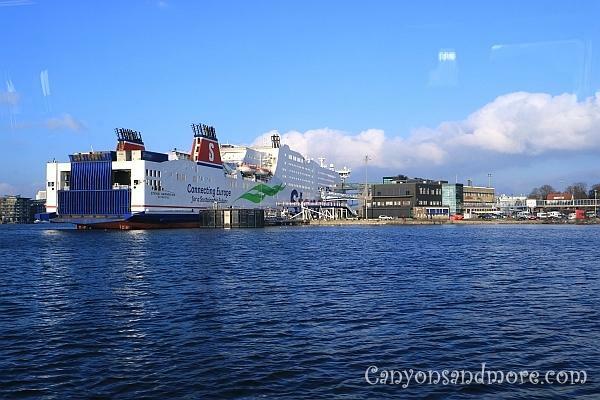 Stena Line offers a short cruise Kiel-Gothenburg-Kiel for a fair price and you spend 2 nights on the ship and almost a whole day in the city of Gothenburg. The image above shows the terminal at the Port of Kiel. The ship is parked at the “Schwedenkai” is taking off now and heading to Gothenburg. One can stand on the deck and enjoy the view. Though it was already evening hours, it was lucky to be still a little light outside to watch the ship leaving the port. 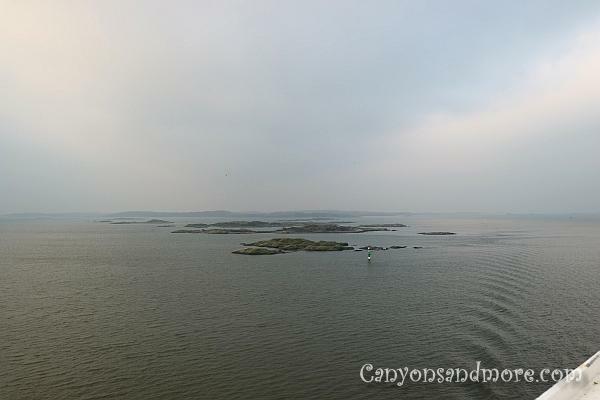 The next morning you can go out on the deck and see all the little islands on the Baltic Sea towards Gothenburg. It was a little hazy, so the view was not as spectacular as hoped for. 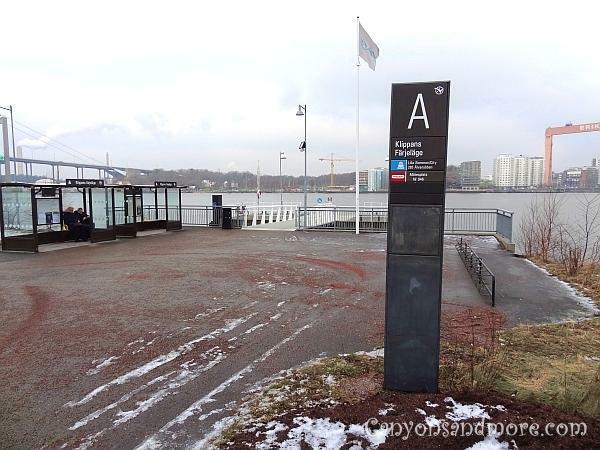 When we arrived at the Port of Gothenburg, we left the ship and could have walked towards the center of the city which is about a 3 km walking distance. But we chose to take a 5-7 minute walk to “Klippans Färjelage” which is a ferry stop close by. From we got on the Ferry Nr. “285 Älvsnabben” and rode all the way to “Lilla Bommens hamm”. The ferries come every 30 minutes and at peak times, every 20 minutes. Their timetable for that route can be found here: Västtrafik and the ride costs about 30 Kronen for 90 minutes. From there we got off and were in the center of the city. The ride is a very wonderful and inexpensive way to enjoy the city from the water. Remember to always have a credit card with you. When you want to pay on the ferry, they do not accept cash. In fact almost everywhere in the city was like that. Even for the smallest sums of money. 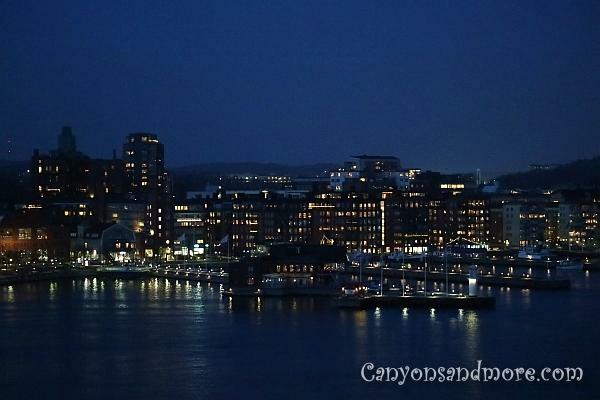 One big advantage of taking the ferry is that you get a fantastic view of Gothenburg from the water. On that particular day, the skies finally cleared up and it was so enjoyable. Close by the dock where we got off the ferry ship is a huge mall called Nordstan that one can go through. On the other side of the mall you are on in the city and can start your ourdoor excursion. The street in front of the mall is called “Östra Hammgatan”. From there one can walk all over and view the sights. 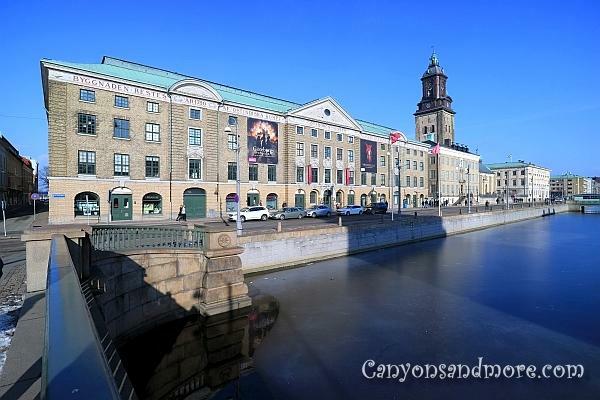 This image shows a part of the Stora Hammkanalen and is off of the “Östra Hammgatan”. 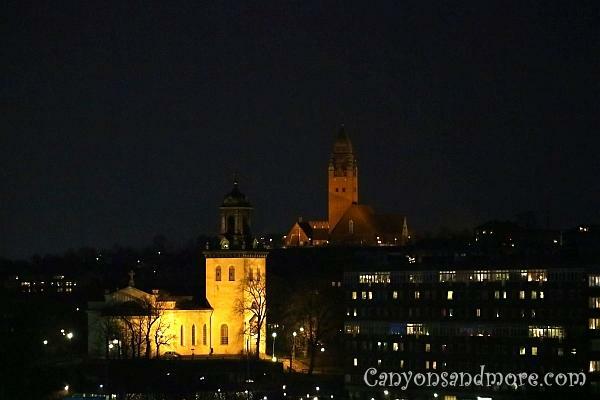 The building in the background is the City Museum of Gothenburg and the church behind it is called the German Church. This location is just behind the Gustuv II Adolph statue which you cannot miss. This was one of our favorite sites called “Salu Hallen”. 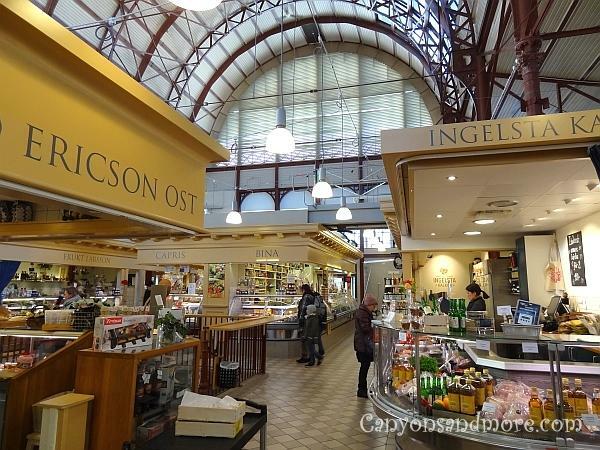 It is an indoor market hall with tons of local culinary specialties. There are also possibilities to sit and eat as well. It is definitely worth a visit. We spent the time just walking through the different streets of the city. Here you can sit and enjoy a hot tea to warm up on a cold winter’s day. When the time came to go back to the ship, we got on the same ferry as before, just in the other direction. 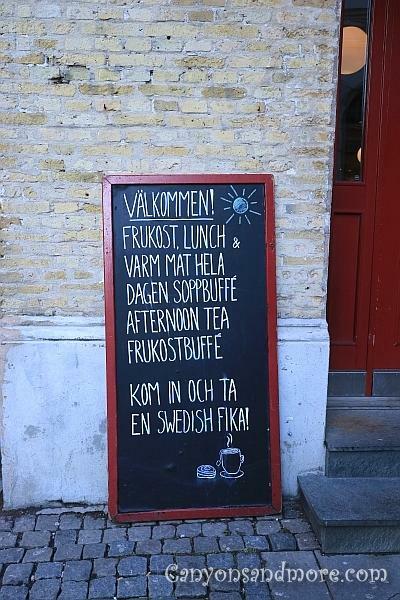 It takes you back to Älvsnabben. This image shows how close the ship is to the ferry stop. It turned dark as just before the ship left the terminal. That is one of the advantages of taking this particular trip in winter. The city looked fantastic by night. On the other side, two churches were illuminated in the night. It looked quite charming.